I went to Wales! Yaaaayyy!! ‘It’s not a hill, it’s a mountain’ which is a quote from a movie with Hugh Grant in, I can’t think what it’s called but whenever I try and copy the accent it doesn’t quite turnout how it should. I am sure the welsh will approve of my efforts. Wales is a beautiful place and although going abroad is lovely, we have so may wonderful places in the UK that are waiting be explored. I was pleasantly surprised at how gorgeous Wales is. The views from the hilltops are incredible. The history, the castles, the people, everything for me was truly inspiring. Fortunately the bank holiday weekend was a scorcher, I did make a number of trips to the St David’s shopping centre to buy sandals and thin tops as I didn’t really pack for summer sunshine. The hottest May bank holiday EVER apparently. My first encounter of the welsh language on my trip was when I went in a Tesco supermarket. I realised I didn’t have any liquid eyeliner with me so I thought I would pop into to buy one. 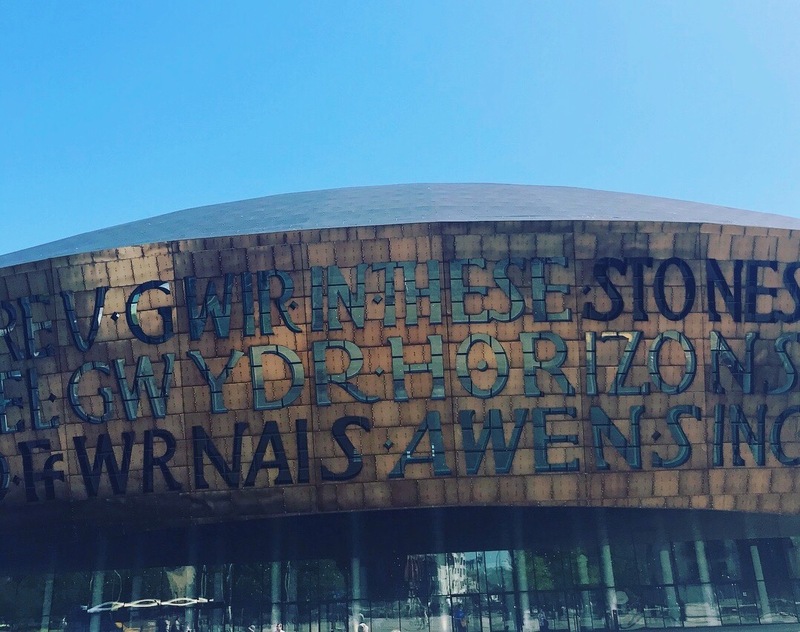 There are signs above the isles written in the traditional welsh language and English underneath. For a split second I felt like I was abroad and unsure of what was going on. I was in Tesco, I knew that, but it felt peculiar to me that I was in the UK reading another language other than English. I said to myself I’m not going to speak to anyone just nod. It was a bizarre moment, I soon reassured myself that language is not a barrier like perhaps it might be abroad. I came across the word Lift in welsh. They spell Lift, ‘Lifft’. I knew after that I would be absolutely fine. I met up with the amazing Lorna whom I have told you guys about in my previous posts. Lorna has done so much for me and I wanted to say Hi whilst I was in Cardiff. She is as stunning in real life as the photos. What an amazing woman. Lorna became my tour guide as I was most definately the tourist. Lorna gave me a tour around the Royal Arcade and the Morgan arcades in Cardiff and they reminded me so much of the lanes in Brighton. Gorgeous little independent shops, cute little cafe’s, I loved hearing stories of her experiences especially of a specific shop called “Wallys’ which caught my eye earlier that day. It has in the shopfront window of the welsh traditional whiskey along with the welsh equivalent of Baileys Liqueur. 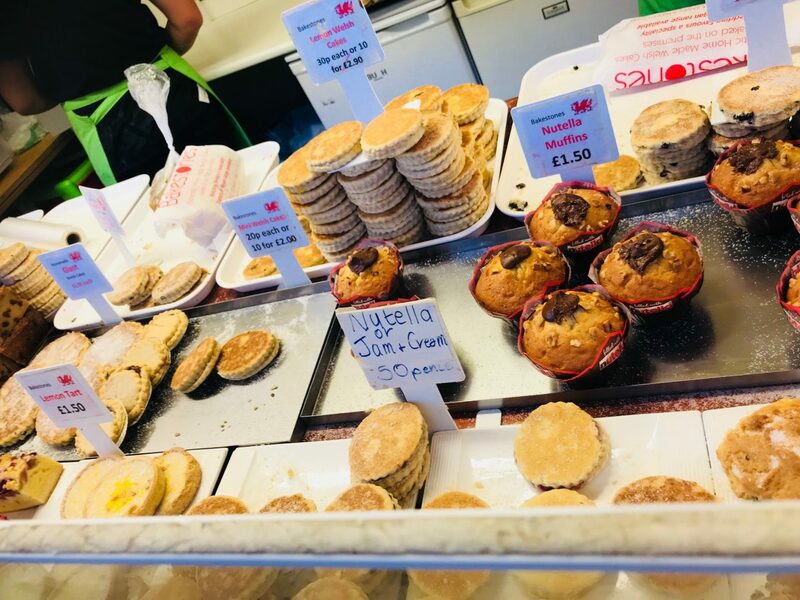 We also headed to the Cardiff Market where I purchased welsh cakes. I have been told specifically by the welsh that I had to try them. Now they are delicious but very similar to scones. This will cause some division and my be an unpopular opinion but to me they are similar. I am sure the welsh will completely disagree with me and say they are far nicer so I won’t dispute it. I did however enjoy the Nutella welsh cake. 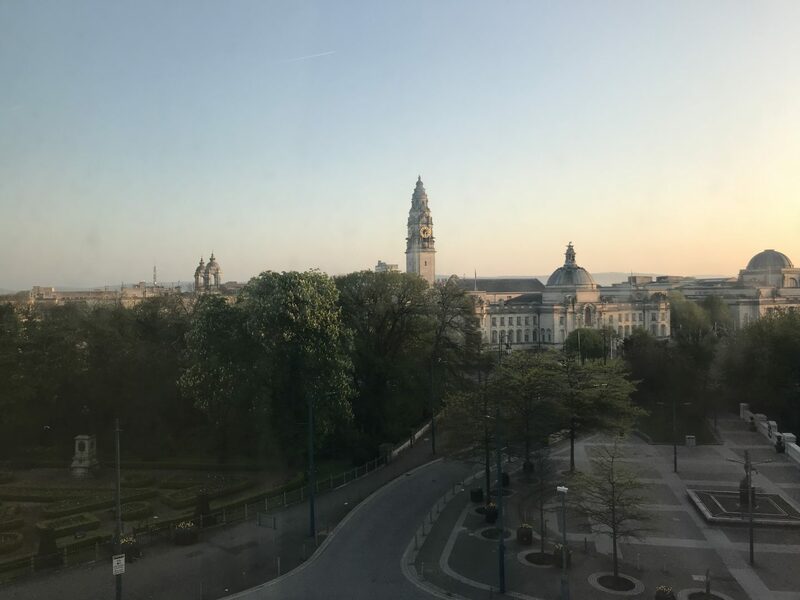 I stayed at the Hilton in Cardiff which is opposite Cardiff Castle and the National Museum. The city is absolutely buzzing day and night. It was a great spot, all the shops literally a stones throw away from the hotel so I spent some time wondering around the shops with the welsh flag flying above and enjoying waking up to the views of the castle. The food at the hotel restaurant called ‘Grey’ was great. I actually had goats cheese and spinach chilli cannelloni twice it was absolutely delicious. Cardiff Castle was open at 9am on Sunday so I had a walk around the grounds and through the tunnels and in the castle itself. The tunnels were really eerie, the voice of Churchill over the speakers declaring war and the signs on the walls of instructions how to put on a gas mask in case of an attack. To put yourself physically in the same place as those that used the tunnels as air raid shelters makes your mind think crazy things and how lucky we are right now. I loved the Castle. The decor and furniture was exquisite. The books on the bookshelf amazed me the most. The exact books read by ones of the Earl’s of Bute. (No idea but it’s history). The views from the top of the castle also were beautiful. I wouldn’t recommend wearing wedged shoes though like me as the stairs to the top are incredibly steep and crumbly. I held on to the iron handle so hard that my hands smelt like I’d been counting 2p’s. I know this as I would growing up count 2ps and bag them up once I’d made a pound and keep them stashed away. A tip is to take some hand sanitiser or hand wipes. Fortunately I did. P.s don’t wear a cream jacket or white top. I also got on a boat from Cardiff Bay to Penarth to have lunch. Before reaching Penarth Marina I stopped to take pictures of the welsh millennium centre which is home to the welsh national opera. I took a photo of what I can only describe as a water tower sculpture outside the opera house alongside the Roald Dahl Plass. I never knew Roald Dahl was welsh. I also went up some hills and more hills, saw sheep asleep on the side of roads whilst cars are passing. No barriers between the road and the fields. Those sheep are crazy. The sun was absolutely beaming and I could see Castle’s on hills miles away because the skies were so clear. I also adored the traditions of the welsh not just the welsh cakes but the love spoons that are carved by hand with significant meanings. I had plenty of time to get my head straight, think about what the next step is for me and my business. Lorna gave me some pretty fab advise and has given me a boost I needed to take Melita Latham London to the next level. This weekend was definitely needed as it has in all honesty been an uncertain time for me recently. I have questioned things an awful lot. Some things perhaps I should not let worry me but it ends up being a snowball effect and one thing just rolls into another. It’s endless in my mind at the moment. We’ll soon see how long it lasts when I get back into work and return back to the norm. Oooo I forgot to mention. I tried some amazing cheese. It’s called Black Bomber cheese and it was made by Snowdonia Cheese Company. IT.WAS.DELICIOUS! If you are a cheese fan like me…(you’ll know from my other posts how much) then you must try this cheese. On crackers, oh gosh, amazing! I can’t wait until my next visit to Wales and hopefully I’ll have some more amazing things to share with you. Get exploring the UK there is so much to see and do. It’s all right on our doorsteps and we should take advantage of that. Next stop is……..a secret.